The SOS Program is designed for children ages 4 to 7 years old who are interested in learning the fundamentals of sailing including boat and water safety, parts of the boat, boat handling, and wind awareness. This program will build confidence and sailing skills for children who have not yet reached the minimum age required for ISC Sailing Camp. Participants will leave the program with the skills needed to excel as they graduate to camp at the appropriate age. The program will be conducted exclusively in ISC provided Prams. The pram is designed to be both safe and durable, and the skills learned in a Pram are transferable to any other class of sailboat. As a one-person boat, Prams encourage self-reliance amongst sailors and provide a fun environment to learn and develop boating skills. Participants of this program will have a fun, safe, and instructive opportunity through which boating and life skills can be learned. Parents or a parent appointed “Buddy” are required to involve themselves in the program both on-land and on the water during each class. Each Child’s Buddy either sets sail with the child in the Opti or accompanies the child from a safety boat which will be kept near at all times. 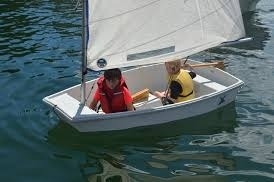 While the program will be led by an experienced instructor, even if a “Buddy” is appointed for on water activities, parents of all boating abilities are required to attend and will be expected to aid in their child’s progression and to participate in the program by helping with launch and recovery of the Prams, rigging and ship shape (ensuring all items are properly cared for and stored at the end of each session). In our second year, we will continue to offer this program with at no cost to members and their children/grandchildren. Parents will be asked to pitch in so that treats and drinks can be provided for the kids at the end of each session. Space will be limited due to availability of equipment. It is STRONGLY encouraged that participants schedule to ensure that they attend at all 4 sessions. Please contact Matt Rush at Matt.Rush@jltus.com or 513-256-2198 I look forward to hearing from you and getting our little ones out on the water. Application of Boat handling techniques (steering and controlling the sails) through Figure 8 course in harbor.